We are approaching the final weekend of the 15th Annual Epcot International Food and Wine Festival, so it is time for one last venture into the marketplace for our final meal of the year. For our final bite of this year’s offerings, we’ll head south towards Argentina and sample the Grilled Beef Skewer with Chimichurri Sauce and Boniato Puree. One nibble of this dish will, quite simple put, make the mouth water. From the time a bite crosses through the lips, every single taste bud on the tongue will find a reason to tingle between the beef, boniato, and chimichurri. The strip of beef is grilled well, with just enough charring on the savory bits to add the desired textural element, but it is the side and sauce on this plate that makes it a palate pleaser. 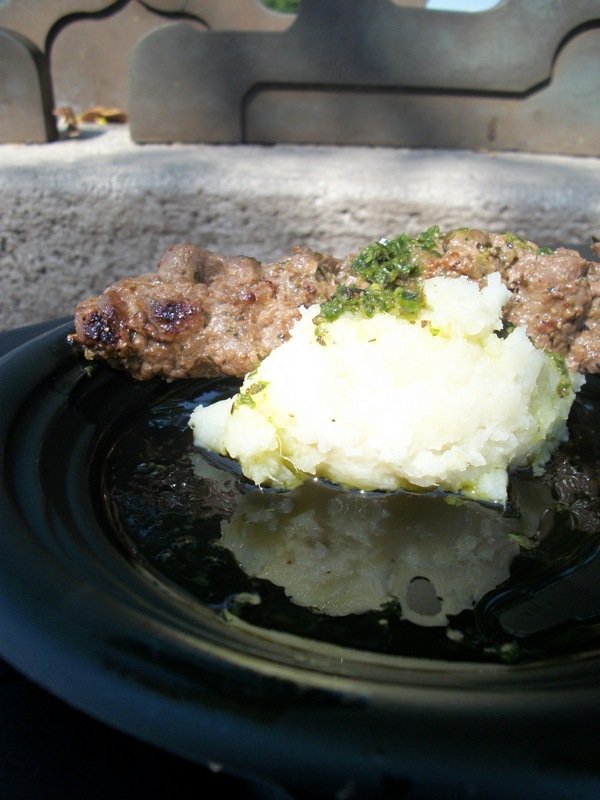 Chimichurri, is a sauce whose basic components are garlic, parsley, olive oil, and vinegar. A variety of other herbs and spices can be added to chimichurris, and the Argentinean version served during the festival makes use of onion and saffron. The mixture, combined with either the boniato or grilled beef, or both, adds a bright, fresh kick to the meal. Boniato is a variety of sweet potato found originally in the Caribbean, but now is grown throughout subtropical climates including Florida. The meat of the boniato is off-white and not as sweet as a typical sweet potato. What it lacks in sweetness, the puree of this dish makes up for it with rich mash that carries an almost cauliflower flavor with it. While not as starchy as a regular potato, the boniato puree pairs well with the beef skewer for the meat and potato crowd. The 2010 Epcot International Food and Wine Festival returned plenty of festival favorites and introduced guests to a world of delicious discoveries. As the event winds down this week, the Grilled Beef Skewer with Chimichurri Sauce and Boniato Puree is certainly a contender for a final supper. I couldn't agree more!!! The beef skewer at Argentina was truly one of our favorites. In fact, it was the last thing we ate at our last visit to the festival on Monday. We have been over to the festival 6times and 4 of those times included the Argentina beef skewer. We also loved the corn empanada from there.